Pêyakwâw êsa mîna ê-nanipât awa pêyak kisîyiniw, kâ-pawâtât onôtokwêma ê-pê-kiyokâkot. nikotwâsik askîy aspin ê-kî-nakataskîyit. êkwa ôma êkwa otahcahkwa kâ- pê-kiyokêyit. mitoni pîkwêyihtam êsa awa kisiyiniw, êkwa ôma ê-kamwâcipayit, ê- simatapit. nohtê-kiskêyihtam ôma, tânêhki kâ-pê-itohtêyit. Mâci-pîkiskwêyiwa êsa ê-itikot, “ê-pê-itisahot ôma Mâmawi-ohtâwîmâw ta-pê- wihtamâtân kîkway. ana ohci oskinikîs kâ-kî-nakataskît ôta namôya kayâs. Ispî kâ-takohtêt ôtê ahcahk-askîhk, pê-nakiskâk oskâpêwisa ê-kiskinohtahikot ê- wêhcasiniyik mêskanaw. pêyakwâyak anita, nîswâyak paski-môniyâw ôma mêskanaw nistam anima kihciniskêhk k-êsi-paskêmok mêskanaw, êyako pimitisahamwak. êyako mîna mitoni miywâsin ta-pimitisahamihk. piyisk kêtahtawê k-ôtihtahkik ita ê-ayâwiht tâskôc ê-wâ-wîkihk. sêmâk ôhi wîci-oskâya pêyakwan ê-ispihcisiyit, kâ-pê-nakiskâkot, êkoni ôhi osk-âya mêtoni nanâkatohkâtik. Kâ-mâci-pîkiskwâtikot ôhi oskâya ê-nêhiyawêyit. mâka namôya nisitohtawêw awa oskinikîs tânisi ê-itwêyit âta wîsta ê-nêhiyawêt. ahpô mîna apihkêw tâskôc mâna ôki nêhiyawak mitoni kâ-pimitisahakik onêhiyâwininiwâw. pîkwêyihtam ê-wanihkêt awa oskinîkîs. âsamîna sipwêhtahik oskâpêwisa kotak êkwa anima mêskanaw ita kâ-kî- ohtohtêcik. Êyako mîna ôma mêskanaw miywâsin êkwa wêhcasin ta-pimitisahamihk. otihtamwak wâskahikana ita câh-cîki ê-wâh-wîkihk. âsamîna êkota kotaka osk-âya pê- nakiskâk mâka êkwa ôki oskâyak namôya cîki pê-nâtik, wâhyawês ohci osâpamik, ê- pômênâkosicik ê-kanawâpamâcik ôhi oskinîkîsa ê-nêhiyâwinâkosiyit. nanitohtawêw ê- kîmôci-pîkiskwêyit. âtiht piko kîkway kâh-kahcicihtam. êkoni êkwa nisitohtawêw oskâya osâm piko ê-âkayâsîmocik, mâka namôya tâpwê cîkêyimik k-îsi-waskawîyit. 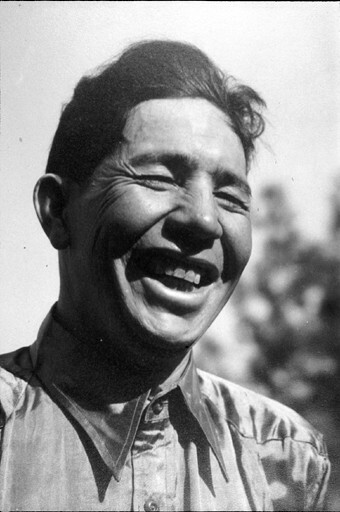 mâmisihow, ê-pa-pêyakot ê-nitaw-mâmitonêyihtahk tânêhki êkâ nânitaw kâ-kî-wîcihiwêt. One day while sleeping, an elderly man was awakened by his deceased wife of six years. She came in spirit form. The elderly man had mixed feelings about this visit but nevertheless managed to remain calm and sat up curious wondering why she had come to visit him. She began to speak, “Listen very carefully… I have been sent by the Creator to tell you about a boy who passed away recently. Upon entering the spirit world he was greeted by an Oskapêwis (Helper) who led the young man down an easy road to follow. At a certain point the road forked going in two directions. They first traveled down the road to the right. This road was also easy to follow. After walking for some time they came to a village. A number of young people about the same age as the youth came running towards him. The group of young people stopped to observe the new boy who’d been brought to them by the Oskapêwis. 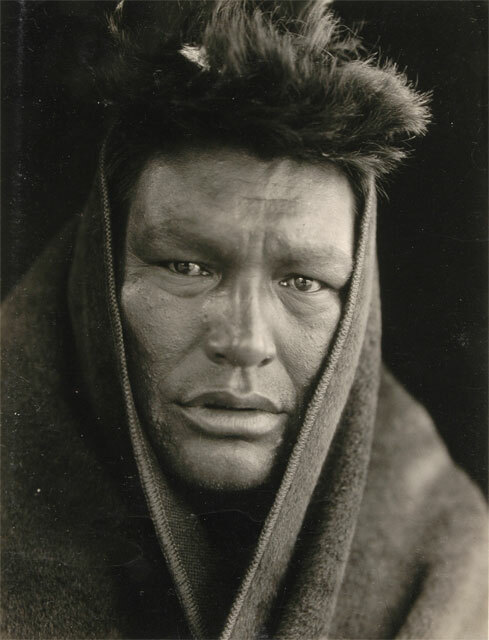 The young people then began to speak in the language of his ancestry – Nêhiyawêwin (the Cree language). Unfortunately the young man could not make out what they were saying even though he was of the same nation; Nêhiyaw. He even had the two long braids of hair, common trademarks for Nêhiyawak who were following the Nêhiyawin (Cree worldview) way. Confused and feeling lost, the young man was quickly whisked away by the Oskapêwis towards the other road at the fork. This new road was also easy to follow. They came upon a cluster of houses and another group of young people came towards him. Only this time these youth kept their distance with disappointment written all over their faces upon viewing his Aboriginal features. Listening to their conversation as they whispered among themselves, the young man could only make out a few words. He was able to understand these youth because they spoke English, but they obviously weren’t interested in this new boy by their behaviour. He felt betrayed, alone and wondered why he didn’t fit in. 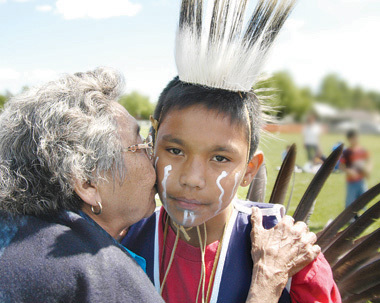 Bottom photograph: An Elder congratulates a boy upon his completion of Grade 6 at an Awasis Day event in Edmonton, Alberta_June 2005.